The best time to practice this kriya is every night before bed. If it is practiced regularly, sleep will be deep and relaxed and the nerves will regenerate. After a few months, the rhythm of your breath as you sleep will be subconsciously regulated in the same rhythm! You will think better, work better, share better, love better, and fight better. This rhythmic mantra will eventually progress so that even in daily activities you will automatically hear the mantra and take on the breath rhythm. Mystically the effect is understood in numerology. The number 11 is the number of infinity in the world of material and the conqueror of the physical realm.The number 22 is the infinite number of longing and mastery of the mental realm. The breath is regulated in 22 beats and gives the mind the power to stretch to the infinite. There cannot be enough praise of this meditation and its growth promoting effect on the personality. It gives radiance and the radiance gives patience which is the first condition of real Love. In Love you give without attention to all the mistakes of another as the sun gives light and warmth to all people. The incorporation of this practical universality in the personality comes with the disciplined practice of Shabd Kriya. A) Sit in any comfortable posture with the spine straight. Place the hands in the lap, palms up with the right hand over the left. 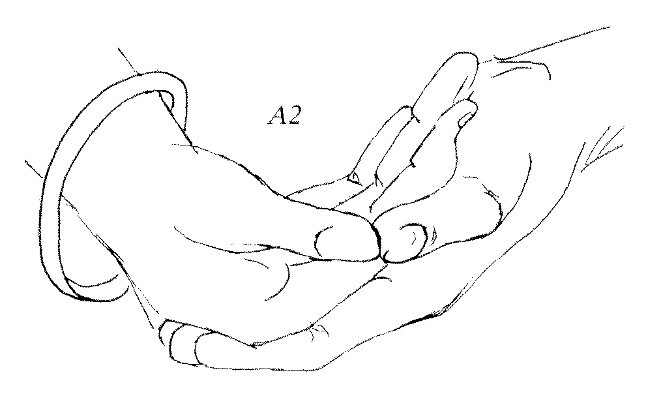 (A 1) The thumbs are together and point forward. (A 2) Focus the eyes on the tip of the nose, the eyelids half-closed. Inhale in 4 equal parts, mentally vibrating the mantra SA-TA-NA-MA. Hold the breath, vibrating the mantra 4 times for a total of 16 beats. 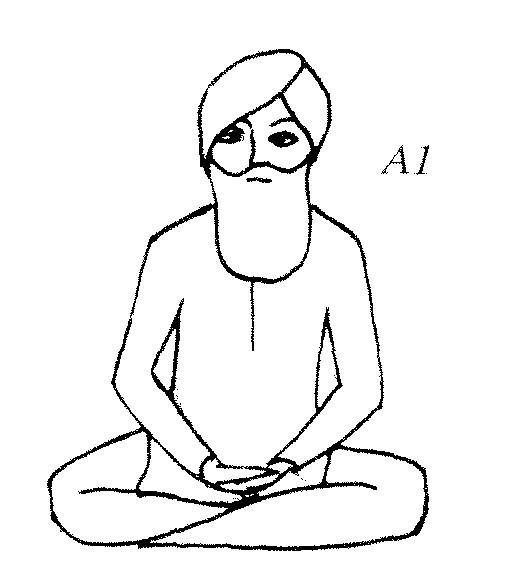 Exhale in 2 equal strokes projecting mentally “Wahe Guru.” Continue for 15 to 62 minutes.